You have 3 days to save the world! It's a game you've never played before! It's an unforgettable mix of thrilling adventures, the most absorbing storyline, enigmatic characters, Egyptian symbolism and Tibetan spirit. 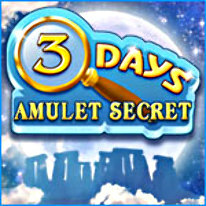 You have only 3 days to save the world, to find all parts of a powerful amulet and catch a group of criminals! Traverse the world: an archaeological site in Egypt; mysterious Stonehenge; and Tibet, with its fascinating shrines. Help super detective, Anna, to solve the riddle and save the amulet...or the world will be ruled by a villain!